Because our world’s mindset is dominated and mostly unconsciously driven by “The Disrespect Philosophy” people’s justification to scoop office supplies or product, use business Internet time for their own personal use, take extra long breaks or lunches, break confidentiality agreements, etc. it is easy for people to justify their choices, especially when they are resentful because they feel they are being taken advantage of by low wages or even with high wages but without their even more basic need being met … feeling valued … respected … in how they are treated on a day-to-day basis. Inherent in each and every one of us is the driving need to feel valued … respected … not for what we have … what we can bring to the table … but simply for being a unique individual … a human being … a life. Fill that need … increase people’s “Respect Levels” by showing them how to “Connect the Dots … with The RESPECT PRINCIPLE” and you will not only see your control costs go down, you will also see increases in motivation, productivity, cooperation, while also reaping the benefits of better health maintenance that will translate into less time off for health reasons, lower medical care coverage and overall, an enthusiasm that will infuse your company with fresh, positive energy and lift your company’s morale and ROI more effectively, efficiently, and compassionately than you ever considered possible. Order your copy today of “Connecting the Dots … with The RESPECT PRINCIPLE” to discover how one simple shift in your and your organization’s culture will achieve what nothing else has yet achieved for your best Return on Investment yet. Visit http://www.therespectprinciple.com to learn how you can also be one of the first 100 recipients to receive a numbered and signed copy! Some followers of Christ may consider Connecting the Dots … with The RESPECT PRINCIPLE not valid because it does not refer or quote The Bible directly … and that is intentional, but that does not mean the work was not inspired by God. Personally, I was raised and schooled with the Catholic tradition, but a number of experiences, (you will be able to read the fiction book, DARK HORSES, inspired by true events in 2015), caused me to reject Catholicism and ultimately God. For years, I searched for something to believe in and for a while I did not even bother to try … just tried to stay alive on my own. But twenty years ago, during an extremely tumultuous time in my life, I turned to God and said, “If you truly exist, then give me a reason for all I experienced and a purpose; otherwise take me home.” That night, the birth of what I now call Connecting the Dots … with The RESPECT PRINCIPLE was placed in my heart. But, it took me twenty years to come back to truly believing in God, which I now do wholeheartedly, because in reading an amplified Bible I discovered the words that support the Connecting the Dots … with The RESPECT PRINCIPLE idea that He directed me to write. However, the work was written for the “religion” of today … intellectualism … founded on the principles of philosophy and science … logical and practical … yet with the added component of compassion to reach non-Christians and to reach people such as myself who turned away from believing in God or even grew to hate him because of what Christians, in their own ignorance of God’s teachings because of what was erroneously taught them or through their own afflictions, hurt us to the point our faith was shattered … hence the many empty traditional churches and lost, scared, and lonely people. For me, all that led to the development and authorship of Connecting the Dots … with The RESPECT PRINCIPLE is what helped me to heal … at first, intellectually and eventually spiritually. Bringing people back to what is good in them and in our world is my purpose … what was placed in my heart. It may not fit into what many Christians consider God’s word or work, but if they really know God personally, they know he uses all kinds of people and all kinds of ways to teach and heal. And, in fact, he likes to use the unexpected, the perceived least likely or least worthy … in order to confound those who think … who judge themselves as above others … more spiritual or more of a Christian … but ironically, there is truly only one kind … a believer. Once my Respect Level rose high enough, I was empowered to examine my beliefs and to change those that were limiting, negative, and harmful to my existence … and opened the door to see the spiritual side of me … of life … and God. Both books, The Bible and Connecting the Dots … with The RESPECT PRINCIPLE, are intertwined and once you have read both you will know the latter came from the former … just presented in a different way to reach those whose religion is the popular intellectualism so their hearts and minds will be opened to the possibility there is much more to life than what we see … thank God! A few thoughts for the day … God is not a respecter of persons … because he “values” everyone equally and God’s primary command of Christians is to love one another … and while we are learning to do so, he is asking us to at least … value (not like, agree with, or approve of) … respect … others on our journey back into love. Great news! The first 100 will be signed, numbered copies! Send your money in to get one of the first 100 copies of Connecting the Dots … with The RESPECT PRINCIPLE books that will be numbered and signed by the altruistic entrepreneur, author and The RESPECT SPECIALIST, Kaitlin Ann Trepanier. Little, but powerful, this 60-page softcover book is specifically written for the global literacy level to reach as many people as possible in order to raise the Respect Level globally. When the first 100 have been ordered and paid for, the printer will roll the first 100 off the press and Kaitlin will number and sign each one of the first 100 copies. $10.95 plus applicable tax (In Ontario, .55 for GST) for a total of $11.50. Regular mail in Canada is $3.50 and added to book price is $15.00 per book. $9.95 plus applicable taxes. Light packet airmail from Canada to US is $4.50. Total price per book depends on applicable taxes. Comparable. Dependent on currency exchange rates. All applicable taxes apply. Mailing/shipping dependent on location. PayPal, Email transfer, Money Orders, Cheques made payable to Kaitlin Ann Trepanier. Cash only locally. Delivery expected three to four weeks, depending on production run time. Thank you for your support and efforts in raising Respect Levels … one book at a time! 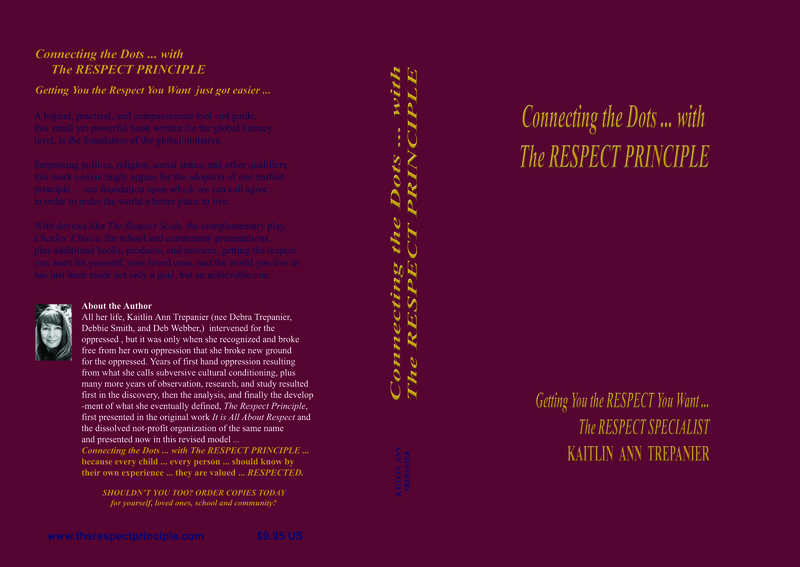 Connecting the Dots … with The RESPECT PRINCIPLE Book Ready for Printer … and for YOU! Perfect bound, softcover 60-page Connecting the Dots … with The RESPECT PRINCIPLE book to help you Get the Respect You Want … and empower you to give more too! $10.95 Canadian. Ontario residents add 5% GST of .55 for a total of $11.50 plus shipping. First hundred books will be signed also. Delivery three to four weeks. At this time, payment methods include PayPal, email transfer, cheque and for one-to-one transactions only, cash is also an option. Payment directions provided when book(s) ordered. Thank you for doing your part to raise our world’s RESPECT LEVEL … because every child … every person … should know, by their own experience, they are valued … RESPECTED. The determining factor will always be the Respect Level of the individual(s). Based on the Connecting the Dots … with The RESPECT PRINCIPLE premise, teachers’ strikes demonstrate adults do not have high enough Respect Levels to resolve issues between the adults … the teachers, administration, and government in a timely manner … even though the impact is severest to youth and children. And then we wonder why youth and children grow up with the mindset that important issues cannot be resolved without conflict and without neglect … the respectful diligence necessary to take care of the children and youth first and foremost … and why they have low Respect Levels for themselves … and their elders.